Here you will find the official calendar of the empire, by which you are able to translate the real-world date into it's equivalent within the roleplay world. In order to keep these running parallel, there is a 'dead day' on 29 February each Leap Year and there are dead days at the end of the real year, so each starts aligned on January 1st every time. Dead days can be looked upon as an opportunity for interesting roleplay. Since they are days that don't exist in the Belariath calendar, they could be thought of as days where actions have no consequences (in IC terms at least). In several earth calendars these dead days were days when creditors had to be paid off. A debtor who failed to do so often killed himself from shame. Temples could use the opportunity for a special festival where the deities have to be coaxed back to our world so that the new year can actually start with their return. Run your ideas through the Quest Group or Admins for utilising the opportunity. The main calendar, used by almost all human realms is called by sages the Calendar of Sosti’m Cor. 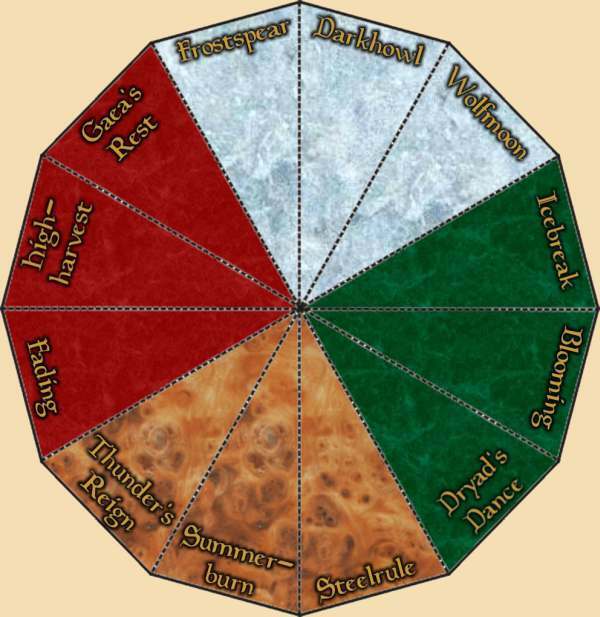 After a massive year wheel made of several differently colored stone slabs, and inlaid golden names, that was found in the ancient ruins of the First Empire. For the normal citizens it is just the calendar, and has no special name, as it is the only calendar they know anyway. Each year of 365 days is divided into 12 months of 30 days. And each month is further divided into 3 weeks of 10 days.